Milk, cream, ice cream, cheese, butter, spreads, yogurt, desserts, drinks. Brands – Dale Farm, Dromona, Spelga, Mullins, Fivemiletown, Rowan Glen, Loseley. 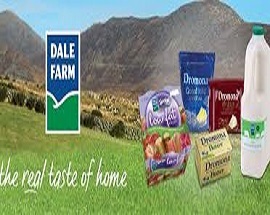 Dale Farm is Northern Ireland’s largest dairy company which is owned by over 1,300 dairy farmers who supply the milk. The Group’s activities span the food chain – from providing farm inputs and services, to collecting and marketing its members milk supplies, manufacturing an extensive range of dairy consumer and food ingredient products, distributing these to both domestic and over 40 export markets worldwide. Dale Farm is committed to adding sustainable value to its members milk through supply chain excellence, consumer led innovation and building added value positions in consumer and nutrition markets. The cooperative was formed in 1995. Since then, the Group has developed its business interests through organic growth and a series of acquisitions. The group now has 10 manufacturing sites throughout the UK. An extensive capital investment programme has been completed aimed at reducing costs and increasing capacity. This has resulted in processing facilities that are best in class. We can’t fit the stockists onto the page. They’re everywhere!